A number of you have expressed interest in what to do if you have a windowless room. A lot of us have basements and many of them are windowless. Or, sometimes certain areas of our homes have no windows because it’s an interior room in an apartment or townhouse. So what are the options if you have a windowless room? You have to check this out. You must. Right now. It’s okay. I have time. I’ll wait for you to come back. And they have it all. Anything you want to see out of your fake faux window! You want tundra and mountains? Done. You want to live under water in a virtual aquarium ? Sure, no problem. Dreaming of tall palms in the twilight? It’s yours. Do the stars and distant galaxies through your “skylight” strike your fancy? Here’s a faux skylight at the Luxembourg center in Paris. This company, Windways, goes even further. They have a virtual window that “moves” with the viewer just as it would in real life. It costs from $10,000-$20,000 to have one of these babies installed. Can’t we just move instead? I dunno, it’s all reminding me of the The Truman Show. I think I’d rather spend a couple of weeks at Canyon Ranch. But what else is there for those of us on Hamburger Helper Budgets? haha Maybe for a kids’ room or playroom. That would be cute. And the price is right. A wallpaper door to the beach with an adorable foot bridge. Brilliant! I hope that it comes with a life insurance policy. After all— that is a solid wall! Ouch! Wait until Uncle Bob has one too many and decides to go for a little dip. Right? But here is the one that I really want to have. This is what happens when one has gotten carried away with LSD. Yes. It’s a floor covering. Okay. Time to get serious. So, let’s circle back to the dilemma. It is frequently a basement or it could be an inside room in an apartment or townhouse or even an area of a large room which has no access to natural light. 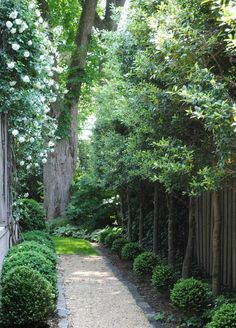 It could be a hallway and very commonly a bathroom or powder room. But here’s what I’ve always found curious. A windowless room is like a room with windows- except at night. The windows are made of glass and glass is reflective. So that even at night the glass is reflecting back into the room any lights that hit it. BTW, I only just realized that when I started working on this post. I never really thought about it before. But, in a lot of ways, I think it’s more psychological than anything. We equate windows with fresh air and good health. And if they aren’t there, it’s unsettling. The first piece of business concerning windowless rooms. What color should I paint them? This may come as a shock to you, but paint them the same as you would a room with windows. We had a windowless basement in our old townhouse. I had it painted a soft yellow. I think it was Benjamin More 937. It’s ever so slightly icy, but it looked very nice with the incandescent lights on. I had a row of recessed down-lights going down the middle and then four wall sconces. It was soft and warm. I just have to interject a short funny-but-not-really story. Laurel lost two out of the four lightbulbs in her bathroom oh– at least 3 months ago. She could not change them because of the fittings. Finally, weeks later, after groping around in the dark and having strangers point and laugh because she was walking around with lipstick dribbling down her chin, she politely asked her super if he could change them for her. Finally, he showed up yesterday out of the blue and changed them for me. He put in two LED bulbs. They are super white. (and yes, I know. They are the wrong kind of LED) And I still have two incandescent bulbs. The color of the walls is COMPLETELY DIFFERENT on the LED side. I mean, like 50 shades different. But, it’s my fault for not specifying exactly what I wanted. That’s the not-funny part. Oh well. But, the point is lighting is very important and the rules for whether the room be dark or light applies to rooms windowless rooms as well. I think that as a rule, smaller rooms can be light or dark and larger rooms tend to look better lighter. And we still need to add architectural interest. We find ourselves in windowless rooms all the time and deem them gorgeous! 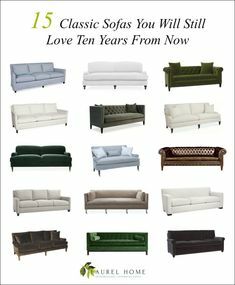 And probably at least 90% of the showrooms at the High Point and other furniture markets. No windows. No windows at all! Nobody’s complaining either. In fact, when I come upon a furniture showroom with exterior windows, sometimes it feels a little weird. But, I figure that we can start with these beautiful furniture showrooms to learn some tricks we can apply at home if we have a windowless room. This is a perfect example of how they used a monochromatic color scheme, mouldings and created “windows” with mirrors. Or at least one of the answers. Mirrors reflect light. And light is what we need, especially if our room is dark. The Christopher Guy Showroom in Las Vegas taken by Jeanne Chung of Cozy Stylish Chic. I love how the mirrors make the space shimmer. The next four images I took at the High Point Market in the Spring of 2016. A wonderful interior window partition. I guess I knew that this image would come in handy one day. From the Dupuis showroom. The booth of Carol Pollard at the High Point Antique Center. That antique Chinoiserie screen is amazing. No mirrors here and no windows either. But lots of beautiful lighting, glass and shiny metallic pieces. One of my favorite vendors, Phillips Scott. Their booth is black and dark grays. It’s stunning in person. 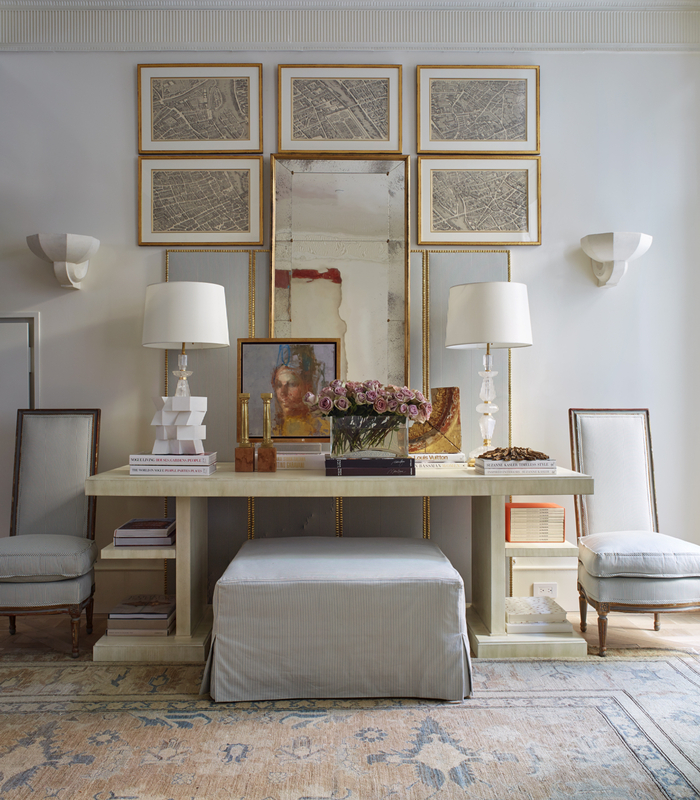 A pretty vignette with a bone inlay table, art prints and blue and white lighting from Chelsea House. It’s to the trade, but you can find a lot of the pieces here. And yes, some of these residential interiors do have windows, but no matter. The principles are the same. How do you feel about the mirrored “window” being flanked by drapes? I’m not sure. I think I would rather see some beautiful mouldings. Love the antique mirror and those red Klismos chairs! Cool home and yes, there are windows in this room, but then at night, when the drapes might be drawn, it’s really the same thing in some ways. And no one corrected me! Original source unknown but found here where you can see the rest of the house. Fabulous mirrored closet doors or any doors with mirrors would be terrific in a windowless room. Beautiful antique mirrors on these closet doors in this pretty, soft bedroom. It doesn’t have to be a mirrored all the way around in a windowless room. Above and below are Suzanne Kasler and both of these are either studio shots or are from the Hickory Chair Showroom in High Point. They used these wonderful Chinoiserie panels in their showroom. Yes, that’s a faux window AND a faux fireplace too! 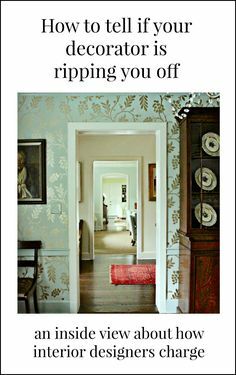 I believe that this is from Suzanne Kasler’s gorgeous home in Atlanta. To see more of her home click here. Nope. Discovered later that this lovely Actually is from the Kips Bay Showhouse2016. Oh man! I found this stunning antique mirror on Chairish and it’s on sale! Now, don’t get too excited. It’s not cheap, but it’s bloody gorgeous and BIG at 48″ x 60″. And also, if you haven’t already been over, there are dozens of new sale items in the HOT SALES in the menu bar. Have to tell you that it’s awfully fun putting these together. In fact, I could do it all day long. These cool mirrors could flank a fireplace (or a faux fireplace) in a room with high ceilings. Or they could flank an armoire if no fireplace. This one is from Uttermost (to the trade) in an interesting rusted version. I found it for sale here. For a lot more window pane mirrors and ideas click here. Fabulous paneled mirrors flank a fireplace. This almost looks like doors until you look more closely. 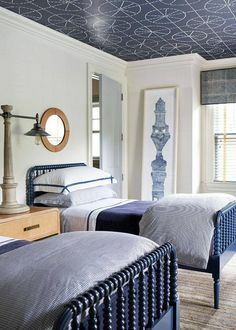 This is a repeat of an image I love which you can see in this post that also has some great ideas for making boxy, plain rooms more interesting. I think that windows on interior walls are fabulous and it makes so much sense to do in a windowless room. Sometimes there’s light on the other side of the wall. But even in a large basement it would be cool to delineate different areas and add a reflective material. Well, I hope that gave you some good ideas for decorating your windowless rooms. And below is a higher res image of half of the room. I love to use the sharpest images I can find. It’s a nutty little thing I have going on, but in the end, I think it’s worth it. What an amazing jewel-box of a room! It’s difficult to tell what’s glass and what’s mirror. It must be magical sitting here! Thanks so much for sharing that J. A.! Oh wait. I found an image from the outside, looking in. And while we’re here… Here’s the entry! Is There Any Hope of Achieving A Chic Living Room On A Budget? I was offered a larger apt. in my building last year. Nice, bigger than mine, view of the Empire State Building. But the kitchen was a tiny coffin – no window (I have a large one in mine), dark cabinets both upper and lower. Since I spend a lot of time in the kitchen and have claustrophobia I made the final decision to turn down the apt. Then a couple of months later I saw what would have been a brilliant solution to the windowless kitchen. I saw an article on Dwell of a couple in SF who put a TV on a wall in a windowless room and connected it to a CCTV camera on the roof. Glad you enjoyed the post. I learn a lot putting these together too because it really makes me think about things and some of them I know more about than others. I couldn’t agree with you more. I never understood why some office spaces have to be so bloody ugly. Not just plain, but it’s as if they said “we have to make this as ugly as possible so that they won’t look at where they are.” I don’t know. My ob/gyn has the tropical ceiling panels in her exam room. Hi Laurel, love this. It’s a problem I often struggle with. Your examples are exquisite. My favorite mirror walled room is Pierre Berge’s study pavillion pictured in House and Garden 2001. I can’t figure out how to put in the picture, but I found it in the peak of chic blog December 2007. What do you think? Oh, I get corrected. Believe me. And most of the time, it’s very kind and appreciated. Now, about that room. Give me something difficult to do. lol This IS what I do. I hunt them down. Images. Sources. And it took me two seconds to find Jennifer’s post with the image. Oh mon dieu, quelle chambre exquise! However, the image is a little small. So, I did my thing and could not, could not find a larger image of the entire space. But I did find one, considerably larger of half of the mirrored study and I posted it on the blog. Oh dear. Thanks for letting me know Paula. Of course, I jumped right in and it is fine for me on my macbook. Hang on let me try my phone. I’m presuming that you’re trying to use my pinit button, not your own browser extension. Well, in the absence of anything else, have you tried first clearing your cookies and cache? And then rebooting if that doesn’t work? If those don’t work, then I am wondering what device/browser you are using. Good morning from Norway, Laurel! An enjoyable post as always, perfect with a cup of coffee on a quiet sunday morning. And very timely – have to decide what to do with the windowless guest toilet in our new farm house. Probably we will go for a ‘sturdy jewelbox’ effect (remember, this is the country where people use winter shoes with spikes!). I love the idea of a big mirror there. But, do I want to see myself in it…?? What are your thoughts on having a big mirror in a small room, like a toilet, straight opposite the door? Will it make people startle? And had to laugh about your lighting problems. Hope you can get it solved. One of the main questions for all of the bathroom lighting in our new house is: ‘Will it make me look good? ?’ At a certain age, one needs all the help one can get.. And I don’t really care anymore if it reflects a true picture of how I look – if it makes me look better, I feel better, and that’s the main thing! The bathroom in the old farmhouse (before we burned it down) was absolutely horrible. Plastic walls with yellowed brown marbling effect, a totally rotten floor – covered with planks to keep you from falling through! One day a mouse came up out of the floor while I was sitting on the toilet. The only lighting was this small fluorescent over the mirror. The cover was so yellowed that it couldn’t be cleaned anymore. To be able to see anything, we just took it off and lived with a bare bulb. It was enough to brush your teeth by, but I still am in the habit of checking any make-up I put on in the little car mirror when I go somewhere! Hope that you’re enjoying the long days in Norway. Are you far north? I did a post in December featuring Longyearbyen and Tromso. I’ve long had a fascination with the extremes of light and dark in the far reaches. About the big mirror opposite the door. Yeah, that might startle people to see themselves as they open the door. I’ve had that happen.